Brooks Koepka traveled around the world to find his game. He found stardom right at home as the U.S. Open champion. Koepka broke away from a tight pack with three straight birdies on the back nine Sunday at Erin Hills and closed with a 5-under 67 to win the U.S. Open for his first major championship. A par on the final hole tied Rory McIlroy’s record score to par at 16 under for a four-shot victory. Not even the wind could stop the onslaught of low scores at Erin Hills. And nothing could stop Koepka. “What I’ve done this week is amazing,” Koepka. His reaction was subdued, just like his close friend and last year’s U.S. Open champion, Dustin Johnson. 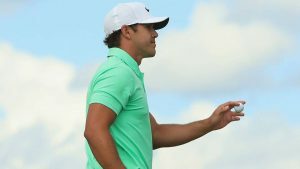 They spend time a lot of time together on the course, in the gym and at home, so Koepka has seen that U.S. Open trophy plenty at Johnson’s house in south Florida. It capped quite a journey for the 27-year-old Floridian. Without a card on any tour when Koepka got out of Florida State, he filled his passport with stamps from the most unlikely outposts in golf while playing the minor leagues on the European Tour Kazakhstan and Kenya, Portugal and India and throughout Europe. Harman’s chances ended with two straight bogeys, and a bogey on the par-5 18th hole gave him a 72 and a tie for second with Hideki Matsuyama of Japan, who closed with a 66. Matsuyama didn’t need to stick around very long. Koepka simply couldn’t miss. Xander Schauffele, a rookie on the PGA Tour playing in his first U.S. Open, birdied his last hole for a 69 to tie for fifth at 10-under 268 along with Bill Haas (69) and Rickie Fowler (72), who was poised at yet another major to win only to fall back. Fowler started one shot out of the lead at the Masters this year and shot 76. He was only two behind when he made the turn, but bogeys on the 12th and 15th holes — and no birdies until No. 18 ended his hopes. Erin Hills, an 11-year-old course shaped out of Wisconsin pastureland, didn’t put up much of a fight without much wind. The strongest gusts were Sunday morning and it tapered to a strong breeze by the afternoon. 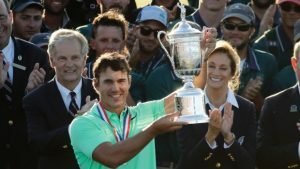 “I needed something to go in and see that to build momentum off it, and just carried that over,” Koepka said.